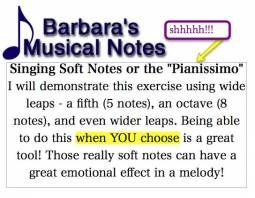 Singing High Notes Softly - or How to Sing Pianissimo! Singing high notes that are well-controlled and NOT always SHOUTED is a skill that many singers find difficult to acquire. For those vocalists who only use the belting voice, the highest notes will usually have to be loud or louder! To sing high notes with control - so that you can CHOOSE your volume level - requires that you use the right MIX of sound. 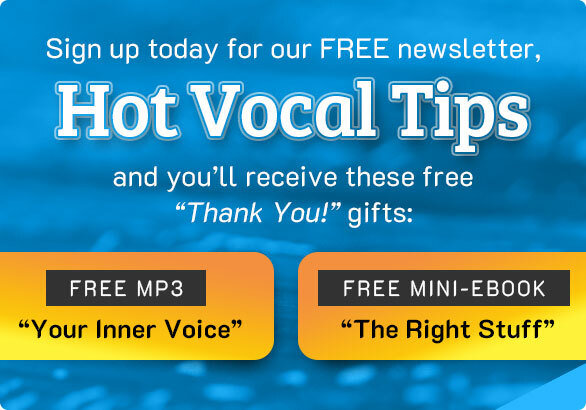 In other words, you must know how to use your head voice. SO HOW DO YOU SING THOSE HIGH NOTES? 2. The lower note needs to be sung with some volume (ie:"MF" or medium loud) so that you have a good foundation from which to move into the quieter, higher note. 3. The movement (opening) of your jaw should be smooth as you sing from one note to the other. 4. The first note and second should be in a mixed voice or head voice. 5. You "know" in your mind that both notes are very close together. You are not reaching for the second note. You open your mouth smoothly and "stretch" the sound from the first to the second note. Now WATCH THE VIDEO! And much of this information will become more clear. I wish you great HIGH NOTE singing!